Do you want to mark dominos, mahjong or other tiles ? Marking tiles may be performed easily by using the "no-mess" Ultra-Luminous solution contained in a marker/pen. IMPORTANT: As you may know, dominos, Mahjong, Pai Gow and other tiles come in a wide variety of colors and finishes. Before you purchase, NU-CONcept STRONGLY advises that you mail us a couple of tiles to test and verify that Ultra-Luminous will work well on YOUR tiles. 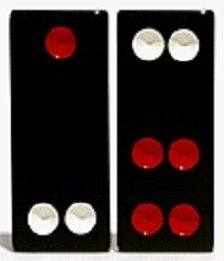 The video clip below is marking dominos. But, the same method is used for Mahjong, Pai Gow and other tiles. Don't want to mark your own tiles marked tiles ? Why not look through them ? Limited production tiles NEW for 2009 !